With an eye towards Black Friday, it seemed like a good time to put up this post. There’s been so much development in tools for FCP X this year that I decided to focus my year-end post of small items strictly around some of the offerings related to FxFactory. Although there are plenty of other developers focusing on Final Cut Pro X, Noise Industries has done a good job of aggregating a divergent set of developers under one roof. Many of the items listed are for FCP X, but quite a few also work inside Adobe Premiere Pro CC. 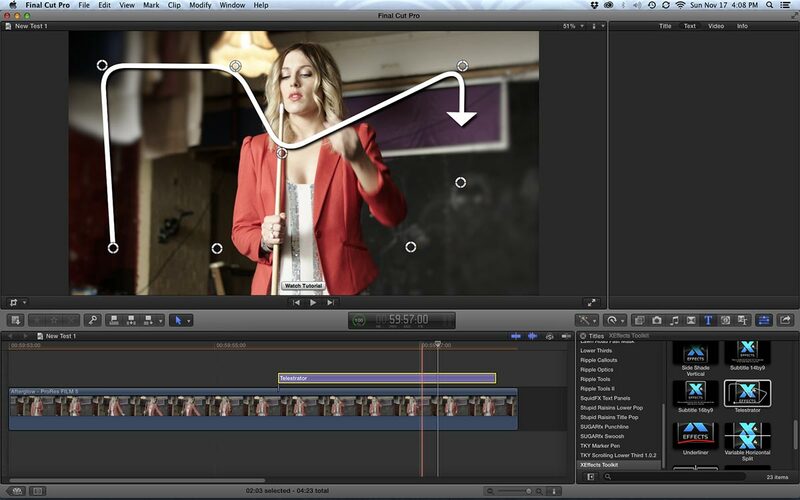 Apple’s Final Cut Pro X uses an effects architecture based on templates tied to the underpinnings of Motion 5. Even if the user didn’t buy the Motion application, that’s the engine that drives FCP X effects. End users and developers can create innovative effects, transitions and titles simply by building an effect inside Motion and publishing it as an FCP X effect. This capability has enabled the Final Cut ecosystem to blossom with many new and useful effects that would be very complicated to replicate in most other editing or compositing applications. Some of the newest tools are even free, such as the Andy Mees filters. Mees is well-known in FCP circles for his older FxScript plug-ins and now he’s developed a handful of useful effects for FCP X. Of particular interest is Better 3D – a 2.5/3D DVE – as well as his Elastic Aspect filter. The latter stretches 4:3 content to fit a 16:9 frame. It is designed to stretch the outer portions of the frame more than the center, in order to leave talent (usually in the center of the frame) less distorted. The folks are Ripple Training are known for software training, but of late have also become plug-in developers with products that include Callouts, Optics, Timelines and Tools. All but the last are design themes with graphic overlays. Timelines is a set of templates for animated timeline charts. 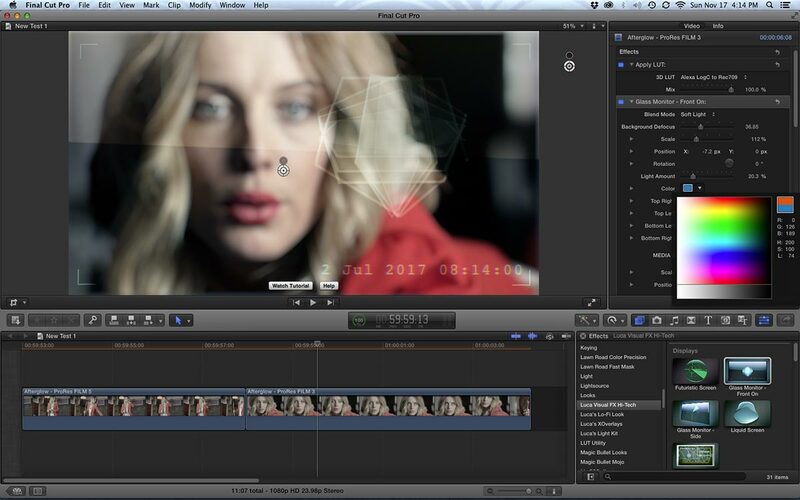 Tools is a mix of useful effects to augment FCP X. These include masks, 3D text, guides, color balance and certain stylized looks. A similar offering is Tim Dashwood’s Editor Essentials. Dashwood develops Stereo3D tools for Final Cut, but like Ripple’s Tools, this group is an editor’s toolkit designed to make life easier. Included are letterbox/pillarbox masks, color correction adjustments, camera horizon leveling, a quick slate template, a dead pixel fixer filter and more. Tokyo Productions developer Simon Ubsdell got into the effects game with FCP X. Some of his newest effects include Chrominator and PIPinator. The first filter turns flat titles into shiny, metallic, extruded text, complete with sheens and glows. PIPinator (as in “picture-in-picture”) is a set of preset DVE moves to fly images in, out and through the frame. Other effects include ReAnimator for dead pixels and Split Animator for various split screen effects. I’ve mentioned Luca Visual FX a few times in my past reviews. 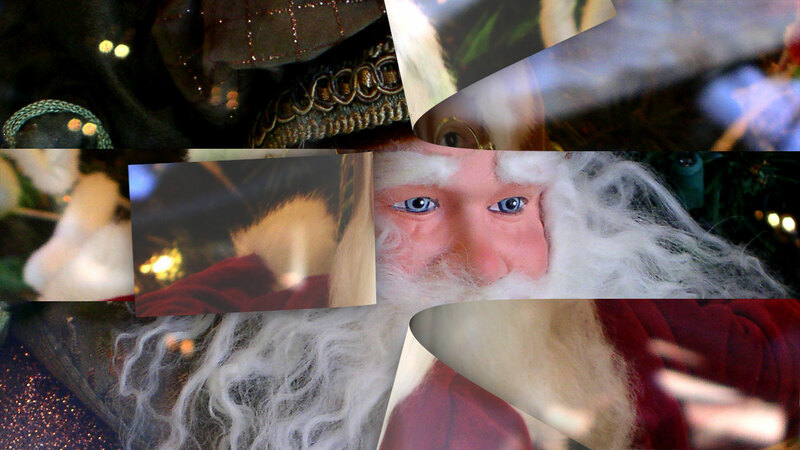 Luca VFX is a great resource for grunge and distress looks. Some new filters and transitions include Impackt and Lo-Fi Looks. The latest – XOverlays – deviates from grunge, by using a set of patterns and graphics as effects overlays. These plug-ins also include image wells within the filter, so you can alter the look by dropping in your own images. Luca has further extended XOverlays, by releasing a set of bonus motion graphics, which may be used in these image wells. Design styles include bands, grids, high tech elements, ripples and visualizers. Another new Luca offering is Hi-Tech, which is a collection of lower-thirds, simulated displays and animations. It’s a perfect package for a show, spot or film that needs a lot of sci-fi style monitors, HUD overlays and digital elements. Each of these can be customized with image drop wells, color changes and the ability to reposition items within the frame. Stupid Raisins has focused on transitions using blocks, panels, shapes and slide effects. Their latest release is a series of title generators with built-in motion graphics, reminiscent of Apple’s LiveType. Although these animations have been integrated into Motion, it’s nice to have them easily accessible within FCP X as an effect. There are 50 titles with a variety of text animation effects. Apply the clip to the timeline and then you can easily modify fonts, text information and style. I’ve only touched the surface of the available tools, but I’ll wrap up with PHYX’s new Flarelight filter. This package includes three glare, lens flare and glow filters, plus noise and star field generators. The lens flare in particular is very nice. It has a ton of parameters to customize the flare and keyframe its movement. Actual adjustment felt a little slow as I was doing it, but it played reasonably well in real-time without having to render – just to see the effect. idustrial revolution – one of the original FxFactory development partners – has added the XEffects Toolkit to their product family. The Toolkit is a set of 53 filters, titles and generators that cover a wide range of needs from the stylish to the utilitarian. For example, where can you find a tilt-shift filter, a telestrator overlay line and a slate/countdown clock all in the same set of effects? Also included are filters that treat standard editing effects – like a zoom – in much the same way as a Behavior in Motion. The last plug-in I’ll mention here is Swoosh from SUGARfx. Swoosh is a set of light brush transitions, titles and generators. The transitions especially show off the power of image manipulation in FCP X. Not only are these a graphic color overlay that wipes from one image to the next, but the path of the light brush effect actually refracts the image underneath. This results in visual ripple or distortion of the incoming and outgoing shots. The transitions run in real-time on a good machine and you have control over a number of parameters, including the gradient colors and the refraction amount. I’ve avoided mentioning color correction filters of various types, since these were covered earlier. If you missed those posts, check here and here for a refresher. I’ve mentioned these in the context of Final Cut Pro, but many of these filters will also show up and work in Motion, After Effects and Premiere Pro with the same installation. It’s a growing ecosystem of tools that makes FCP X a very interesting environment to work in. This entry was posted in apps-gear-filters, Final Cut Pro X and tagged Effects, FCP-X.